Canadian guard Shai Gilgeous-Alexander was drafted No. 11 overall by the Charlotte Hornets on Thursday. He wasn't a Hornet long, as moments later Gilgeous-Alexander was headed to the Los Angeles Clippers in a trade. 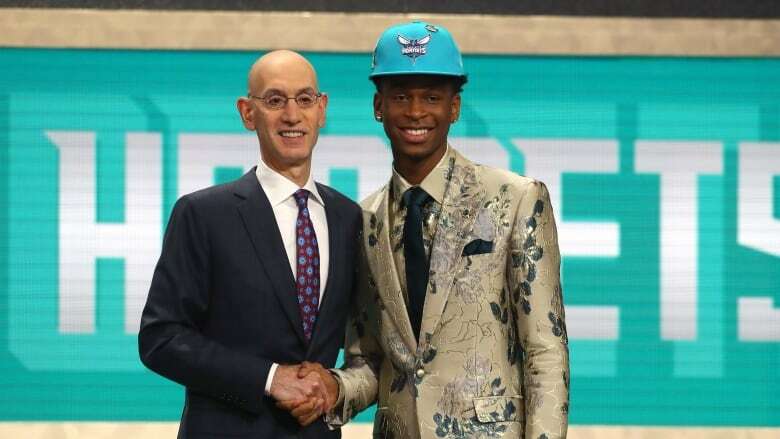 Charlotte Hornets made the pick and then dealt Hamilton-native to L.A.
Shai Gilgeous-Alexander followed a path to the NBA paved by the Canadian players that went before him. And he made a fashion statement while doing it. The 19-year-old, whose draft night attire had social media buzzing, is headed to the Los Angeles Clippers, originally selected No. 11 by Charlotte in Thursday night's NBA draft before he was traded to the Clippers. He became the eighth Canadian lottery pick in history. "I feel like we're on the rise," Gilgeous-Alexander said of Canadian basketball. "I guess over the past couple years we've gotten a lot more resources and more exposure to basketball over here. The world is starting to realize how good we are at basketball. I don't think it'll stop soon. There is a lot of good kids over there that have a good potential. I think we'll be really good. I think this is just the beginning." He was traded to the Clippers for the draft rights to Miles Bridges and a couple of second-round picks. Justin Jackson of Toronto was the second Canadian drafted on the night, is headed to the Orlando Magic. Originally drafted 43rd overall by Denver, he was traded moments later to the Magic. The Toronto Raptors had no pick in the draft, and attempts to trade into it were unsuccessful. Gilgeous-Alexander, who was born in Toronto but grew up in Hamilton, showed rapid improvement in his one season at Kentucky. He came off the bench before working his way into the starting lineup, and scored 16.4 points per night the rest of the way. He averaged over 19 points, almost seven assists, and shot over 50 per cent from three-point range in his final 10 games with the Wildcats. Considered the best point guard in the draft, Gilgeous-Alexander has impressive length — he's six foot six, with a six-foot-11 wingspan. "I'm a playmaking guard, pass-first point guard," he said. "Like to get teammates involved. Good leader. Likable guy. I'm really just willing to do whatever the team needs me to do to win." Long before his name was called at Barclays Center, Gilgeous-Alexander was all over the internet for his champagne-coloured floral suit. It was made by Jhoanna Alba, whose company ALBA is known for dressing over 1,000 pro athletes and entertainers. "When I was getting fitted for my suit, I had no intentions of getting something like this. I wanted to look nice, but nothing this crazy," he said. "I noticed there was this square of fabric on the table next to me while I was getting fitted. It had this pattern and this colour [champagne]. I tried it on the trim of my jacket at first. I liked that a little bit and then I tried the whole jacket and figured out I really liked it. Then I put the whole suit together and fell in love." The fashion was a highlight on an otherwise ho-hum draft night. Trae Young, who's headed to Atlanta, wore suit-shorts, similar to LeBron James' Bermuda shorts style during the playoffs. "I wanted to be different," Young said. "No one has ever rocked the shorts before at the draft." Wendell Carter Jr. wore a Gucci scarf inspired by "Black Panther." Even his parents wore Gucci outfits bearing tigers inspired by the Marvel Comics movie. Gilgeous-Alexander follows a string of Canadian lottery picks. Anthony Bennett became the first Canadian to be picked No. 1 overall, to Cleveland in 2013. Andrew Wiggins followed him a year later, also selected by the Cavaliers with the first overall pick. Tristan Thompson was the highest Canadian draft pick before Bennett when he went fourth to Cleveland in 2011. The 21-year-old Jackson declared for the draft last year but withdrew his name to return to Maryland for another season. But a shoulder injury prematurely ended his college career in late December. He'll join fellow Canadian Khem Birch in Orlando. The Raptors, meanwhile, hoped to trade into the draft. How close were they? "You probably have to ask the other teams to be honest," said GM Bobby Webster. "I think we had a few things early, a few things in the middle and a few things late. I think we thought they were close, but you don't really know." Webster noted the lack of movement on the night. Not one player under contract was dealt. "I don't know if something's going on around the league and people are a little hesitant with personnel and just wanted to do draft picks tonight, and we didn't have a draft pick so we got shut out," Webster said. "We were thinking this has to be the first time in history that one actual player under contract hasn't gotten traded. Maybe some uncertainty with salaries, where things are headed. I couldn't really tell you right now." The Raptors will now turn their attention to free agency which begins July 1, and evaluating their current roster. Toronto's free agents are Fred VanVleet and Lucas Nogueira.